I enjoy the Hellboy Winter Specials because they contain several short vignettes that are usually very good, and this year’s is no exception. It is comprised of three short tales: “The Great Blizzard,” “God Rest Ye Merry,” and “The Last Witch of Fairfield.” While the last two were good and worth reading, it was the first one, “The Great Blizzard,” that interested me the most. The premise of the story is that there is an unusually heavy and prolonged snow in England during the late 19th century, and Sir Edward Grey and Sarah Jewell are investigating whether the cause is supernatural. While walking through the bleak whiteness, Edward tells Sarah about similar occurrences that were supernatural in origin. One of the things I love about Hellboy is that the writers draw on actual myths and legends as inspiration for the stories. I was unfamiliar with the references, but did a little research and easily discovered the details of the myths. In partnership with the goddess Brìghde, the Cailleach is seen as a seasonal deity or spirit, ruling the winter months between Samhainn (1 November or first day of winter) and Bealltainn (1 May or first day of summer), while Brìghde rules the summer months between Bealltainn and Samhainn. Some interpretations have the Cailleach and Brìghde as two faces of the same goddess, while others describe the Cailleach as turning to stone on Bealltainn and reverting to humanoid form on Samhainn in time to rule over the winter months. In addition to the quality writing and the references to mythology, the artwork is top notch, making this a graphic novel definitely worth picking up and reading. Thanks for stopping by, and have an inspired day. This poem is about the place of winter in the cycle of the seasons, and how winter symbolizes the point in the cycle of life that marks the transition to rebirth. We generally imagine Eden as a lush green paradise; but here, Frost presents us with a version of Eden that is stark white, lacking in rich verdure. But as one looks closer, the seeds of life become apparent. Images of buds and berries abound, all symbols of rebirth. I had to look up what conies are, and learned that they are rabbits. This immediately reinforced the rebirth imagery for me, since rabbits are often used as symbols for birth and fertility, and associated with spring. I suppose it is no coincidence that I read this poem after listening to a guided meditation about rebirth today. As we are now officially in winter and moving toward the end of a challenging year, I look forward to a symbolic rebirth in the spring. In the meantime, I will nurture the seeds of light and enjoy the beauty of winter. Thanks for stopping by, and may you have a blessed holiday season. As I awoke this morning to find everything blanketed in fresh snow, I felt inspired to read a poem about snow. I opted for this one by Emerson. Visually, this poem captures the beauty of the snow storm. But Emerson is expressing something more profound here, which I find spiritually moving. He is describing snow as divine architecture, as God creating beauty and art through Nature. And the structures which Nature creates from snow are works of perfection, far surpassing the works of humans. This poses the question: If God’s magnificent and perfect architecture is temporary and will melt away, then how temporary are the creations of humanity? I look forward to going out today, walking in the snow, and marveling at the beauty which is God’s handiwork. I hope you all get to go out and have an inspiring day also. Although this is a short, it is very powerful. The crow as a symbol represents death. This is heightened by the fact that the crow is in a hemlock tree, which also represents death. The reference to snow means the poem is set in winter, which is also symbolic of death. So in the first stanza, we have a triple death image that sets a dark and somber mood. But this changes in the second stanza. Frost clearly states that his heart has “A change of mood.” I think that he is describing a scene at a cemetery where a hemlock is growing. It is likely he is actually attending a funeral, but there is no definitive evidence of that. What is clear, though, is that the crow knocking the snow from the hemlock branches has given him hope. 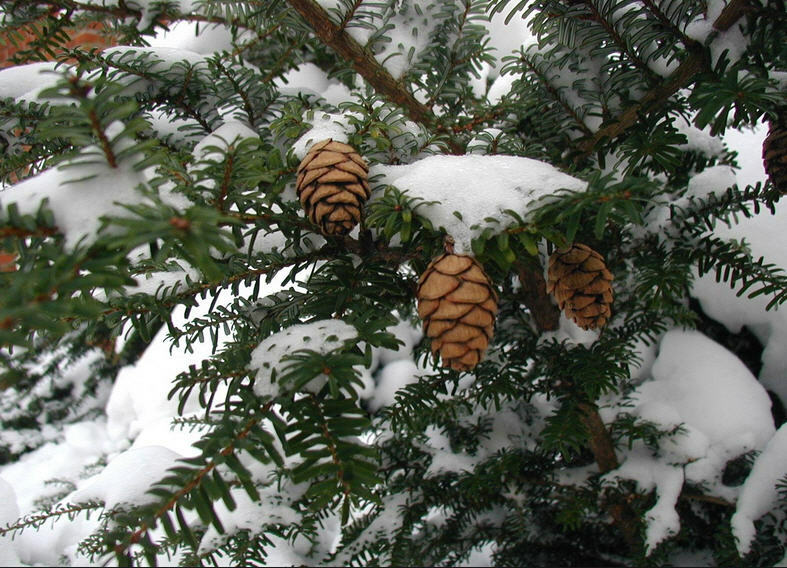 My guess is that it is because hemlock is an evergreen tree and stays green throughout the winter. This would symbolize that life continues after death. So the hemlock tree becomes a symbol of death as well as a symbol of rebirth and regeneration. This alleviates the sadness he feels at the loss of his loved one. Since we have already had snow recently, and it is supposed to dip way below freezing tonight, I figured this might be appropriate to read. For me, the primary metaphor here is melting snow representing the passage of time, the events of our lives melting away and soon forgotten. But what really struck me was the last line: “If I ever read it.” So much of life happens around us without our notice. We are busy with our lives, absorbed in our own thoughts, and we neglect to see events unfolding that may be significant. I try to practice mindfulness and be aware of life as it transpires around me, but then the stresses creep back in and I find myself caught up in the frenzy again. This poem makes me feel a little sad, but it also inspires me somewhat. I can choose to slow down and read the story of world around me and make time to contemplate it, before it melts away. 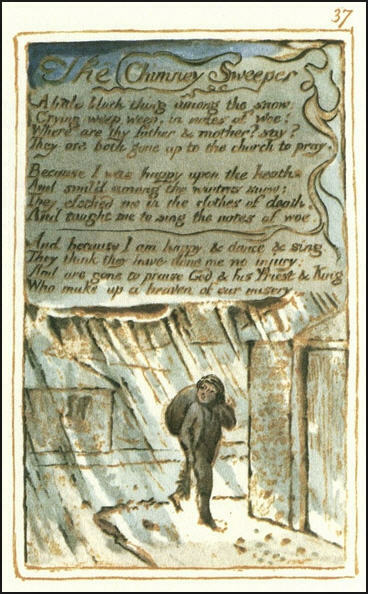 This poem corresponds with “The Chimney Sweeper” from the Songs of Innocence. I have to say that although this one is shorter than its corresponding poem, it is much more powerful and visceral in my opinion. While I find the exploitation of children to be sickening, it is almost beyond comprehension that parents could exploit their children. And what this poem does is it points out the way that people justify their abuse and cruelty. Because the child seems happy, they are able to convince themselves that they are not really doing the child harm. But as we all know, true psychological damage happens below the surface. The image of “the clothes of death” is really disturbing. 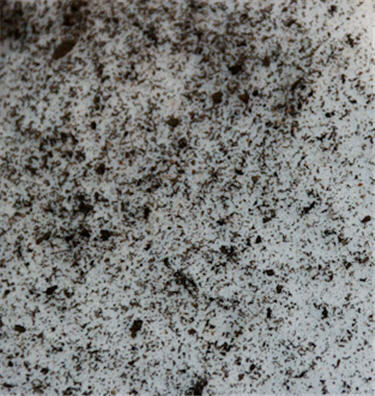 I picture blackened rags, covered with soot and dirt, seeping sickness and disease into the pores of the young child. This contrasts starkly with the white snow, but the irony here is that winter is also symbolic of death. I get the sense that the child will die soon and that this will be his last winter. The last two lines of the poem show yet another level of justification, that of the church. In Blake’s time, church doctrine would have asserted that a child is the property of the parent, and hence the parents could do with the child as they wish. I keep thinking about how, throughout history, religious doctrine has been used to justify social injustice. It continues today. All one needs to do is listen to the arguments against marriage reform. This is a pretty bleak poem and it’s hard to find any hope in it. The only hope I can find is in the fact that enlightened people like Blake recognize social injustice and have the courage to point it out. It inspires me to point out injustice when I see it around me. As some of you probably figured out, I like to write about poetry that is in synch with the seasons. This one is definitely a winter poem. I can relate to the imagery here. I love to walk at night after it has snowed. The stars seem brighter in the cold winter sky and the blanket of crystalline white creates a scene that is truly magical for me. But winter is also the symbolic time of death, and the second stanza certainly evokes that image. It is almost like the snow is a heavenly white funeral pall. So keeping the imagery of winter and death in my mind, I thought about the rest of the poem and tried to grasp the symbolism of the stars. I think the key is the Roman goddess Minerva, who is the virgin goddess of music, poetry, wisdom, and magic. 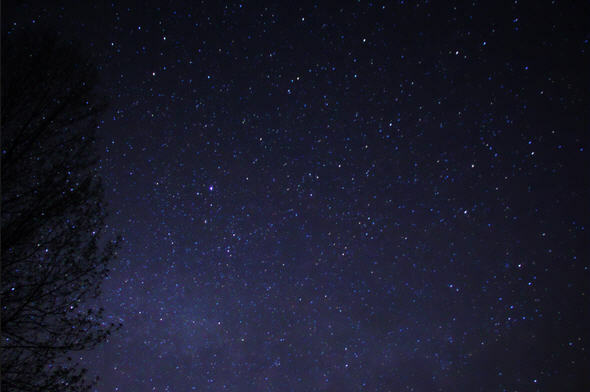 It appears that the stars are a metaphor for either love or artistic expression (possibly both) which, like the virgin goddess, is unattainable. I get the sense that someone is dying, and as he nears his death, he gazes at the distant stars, realizing he will never attain that for which he longed his whole life, be it artistic expression or unrequited love. This poem is both sad and beautiful. While the imagery is gorgeous and full of wonder, there is a deep sadness below the surface, like the cold, hard earth below the soft white drifts of snow.